Sometimes it is necessary to optimize the data returned by a query, removing unnecessary fields from a SELECT statement, and including conditions in your WHERE clause so that the user can retrieve only the data that really needed. It is very important in the critical conditions for small companies, with limited hardware or software. The places where Internet access is limited and slow we also have the need to reduce network traffic data. These are factors that require a query to retrieve only the data that will be displayed in the User Interface screen, excluding the extra that maybe used in another page, displaying of a "Grid View" or "Report". 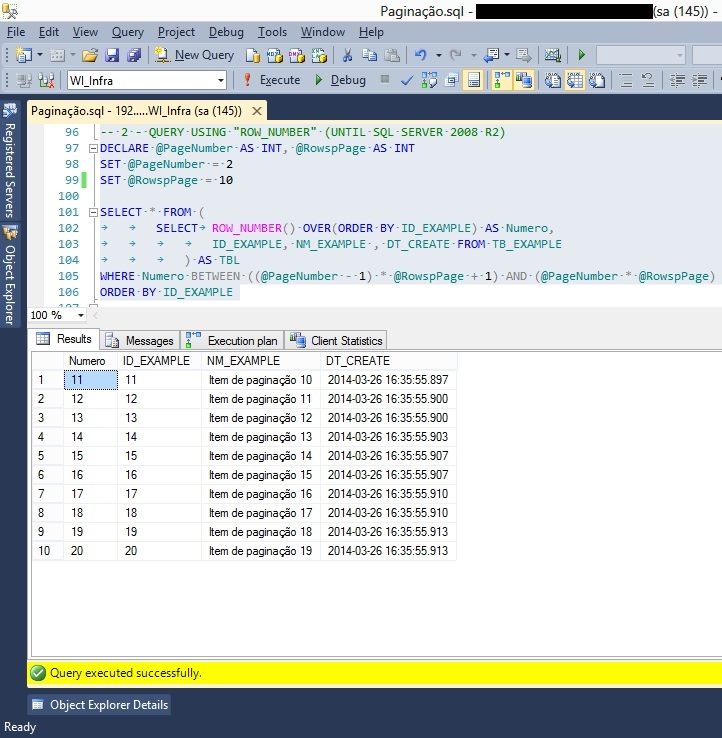 One of the features that can be used to meet these requirements is the Paging in the SQL Server. The main objective of this article is to show how a simple T-SQL script can be useful, when well implemented. This article is part Data Paging serie. So we can reproduce the use of pagination in SQL queries and their advantages for any environment where data are trafficked, we will create a table for demonstration with a one million rows. So we can better assess the performance of different ways to query data. See this output SQL script in the image below. 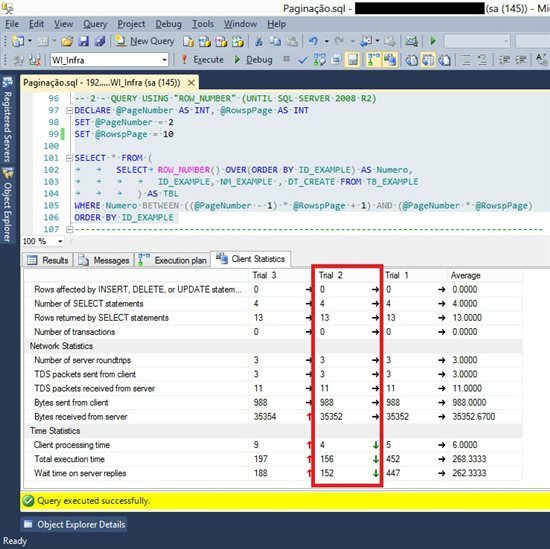 In order to understand the pagination concepts in T-SQL, with ROW_NUMBER and with OFFSET / FETCH, let's define a result pattern in the T-SQL script, for an evaluation of the above queries. After setting these variables, let's start using the function ROW_NUMBER, sorting the data by ID_EXAMPLE field. We can see that a simple mathematical operation that sets the first and the last rows for each page. As this example uses the ROW_NUMBER function is important to know that the first row is the position number "one". In the SQL Server 2012 a new feature was added in the ORDER BY clause, to query optimization of a set data, making work easier with data paging for anyone who writes in T-SQL as well for the entire Execution Plan in SQL Server. 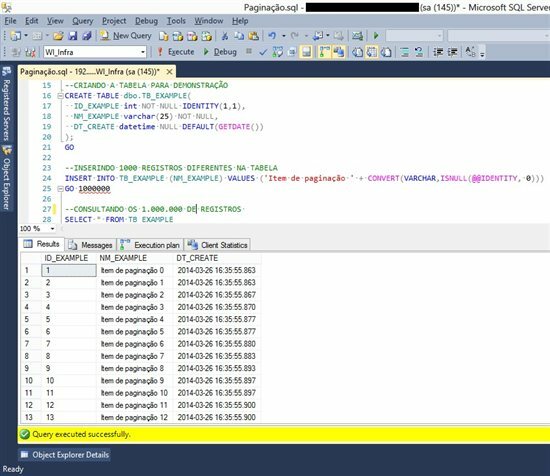 Below the T-SQL script with the same logic used in the previous example. 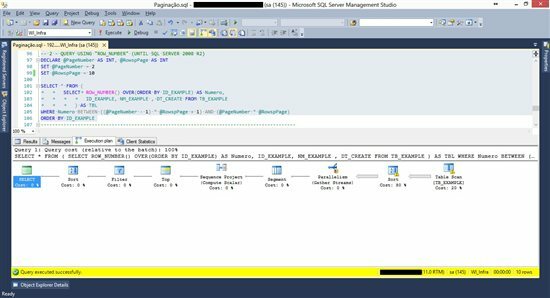 --CREATING A PAGING WITH OFFSET and FETCH clauses IN "SQL SERVER 2012"
We can see that this mathematical operation is simple as the previous one, but the data control process is different due to the new features of the SQL Server 2012 for the ORDER BY clause. This example uses the OFFSET function, then is important to know that the first record starts in the "zero" position. In this SELECT statement, the query in this table using OFFSET function makes simpler pagination, but this new query is more efficient than the query using ROW_NUMBER ? Now, we will analyze the performance. We can see that the pagination of a SELECT statement is simple and has a considerable performance gain. In critical situations, the data paging feature can help to make the user's work very simple and fast. 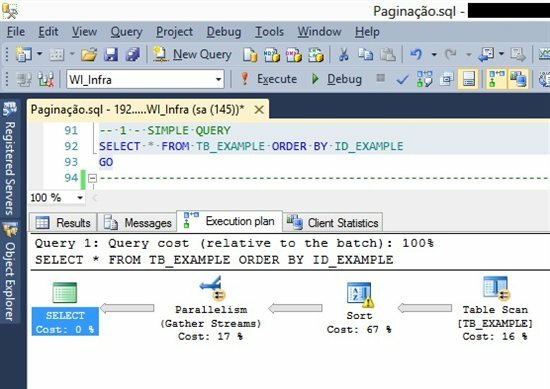 1 - Simple query without pagination in SQL Server (responsibility to maintain the pagination is of an Application ASP.Net, WinForms or other). See "script 1" in the image below. We can see that the simple query without pagination, all the data are used by query and not only the data that the user needs. This is a loss for resources: CPU, I/O disk and memory consumed on the SQL Server instance. Moreover, the time for showing data to the user is much higher because it's necessary to prepare the content in the user interface(UI) for paging through a data collection. In large data volumes and concurrency from use of these same records, it can become a problem. 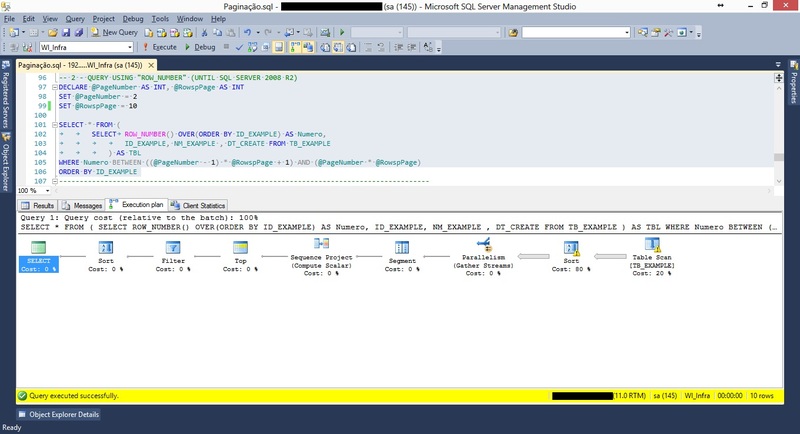 Let's see the cost of the Execution Plan in this query on SQL Server. See Execution Plan of the "script 1" in the image below. This Execution Plan shows the cost of doing the full tablescan due to the lack of an index on the table in a simplified structure. See the Client Statistics of the "script 1" in the image below. To analyze the query performance, we get 3 execution samples and mainly compared the Statistic Time ("Client processing time" and "Total execution time") with better performance. In addition to this excessive time, you will need to create a paging process in the "UI" or your application component ("Grid View", "Report" or other) create this pagination automatically. Therefore, the processing time to data presentation will be even greater. Now we will run T-SQL script using ROW_NUMBER for data pagination. NOTE: Remembering that this model of data pagination works with SQL Server 2005 or higher. -- 2 - QUERY USING "ROW_NUMBER"
See "script 2" in the image below. 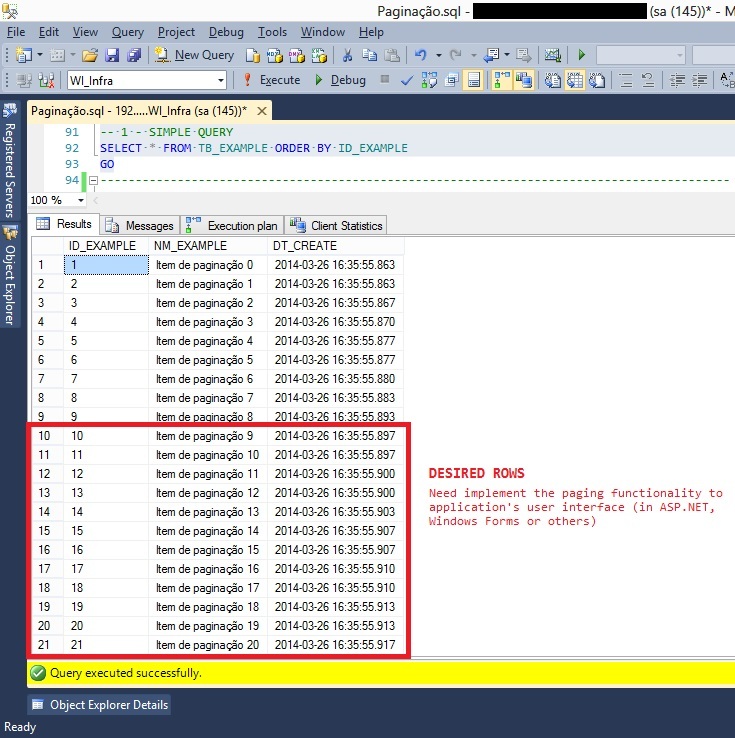 We can see that in the query using ROW_NUMBER, data pagination provides only rows that the user needs. This makes the query more efficient, reducing: CPU process, I/O disk and memory, consumed by SQL Server instance. The time to display data to user also decreases because the data content is ready to view the data through of a user interface (UI). See Execution Plan of the "script 2" in the image below (click image to enlarge). 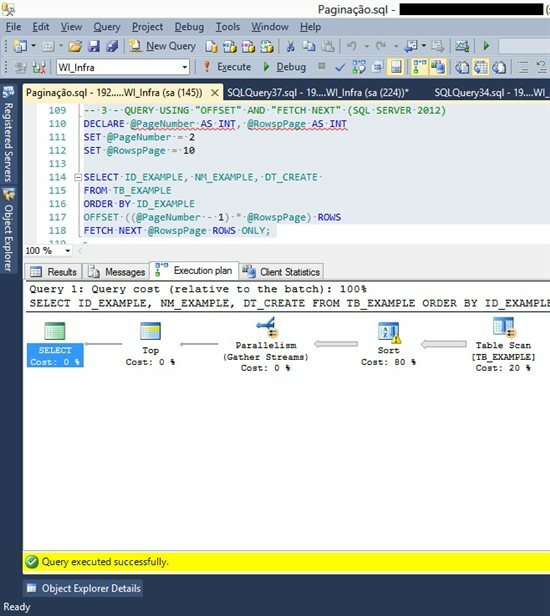 In this Execution Plan, we see a more complex structure where the SQL Server organizes to obtain only the data requested in the query. Although this processing is much larger than shown in the Execution Plan previous (script 1), the running time will be shorter due to the amount of data that is returned to the application. Now we will evaluate the performance of "script 2" under the following conditions. 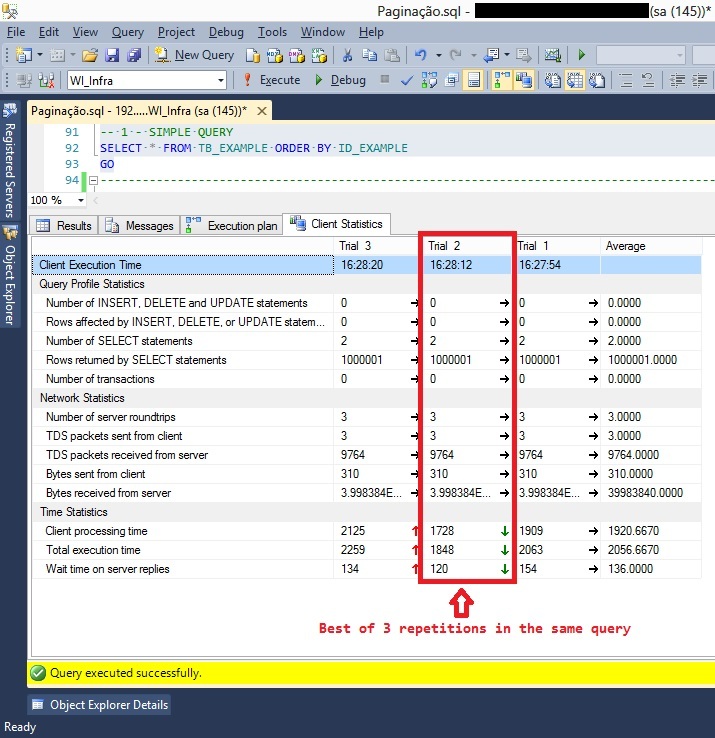 In addition to this short time, with little more than 10 times the query time in "script 1", we can easily see that the reduction of rows returned by query also reflect the decreased amount of bytes sent from the server to the client. Therefore, the processing time of the data and content presentation to user decreases considerably and reduces network traffic between the server and the client application. 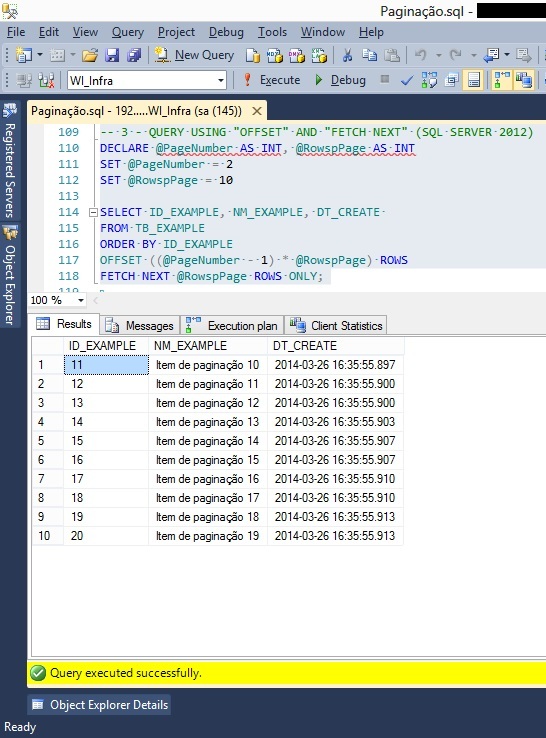 We now execute the T-SQL script using OFFSET/FETCH for data paging. 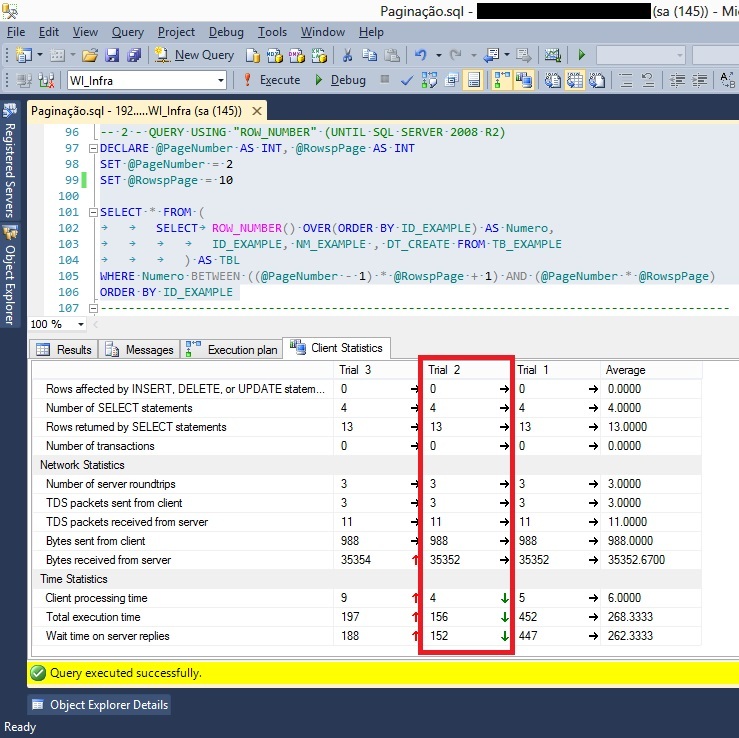 Remember: the OFFSET/FETCH pagination queries only work with SQL Server 2012 or higher. See "Script 3" in the image below. We can see that the query using OFFSET/FETCH, the data pagination provides only rows that the user needs, similar to the "Script 2" (to use ROW_NUMBER). The data query is also reduced and the process is even more simple. See Execution Plan of the "script 3" in the image below. In this Execution Plan, we see a simple structure where the SQL Server can obtain only the data requested in the query. Although this processing be similar to that shown in the Execution Plan of the "Script 1", the execution time will be shorter due to the amount of data that are returned to the user in the application. Now we will evaluate the performance of "script 3" under the following conditions. See the "script 3" Client Statistics in the image below. The processing time was more reduced, with performance a bit better than query of the "script 2" (that use ROW_NUMBER), we can see the reduction in Bytes sent and received, which consequently reduced impact the execution time of the whole process. We can see that the pagination of a SELECT statement is simple to set up and can be considered an excellent resource for large amounts of data. 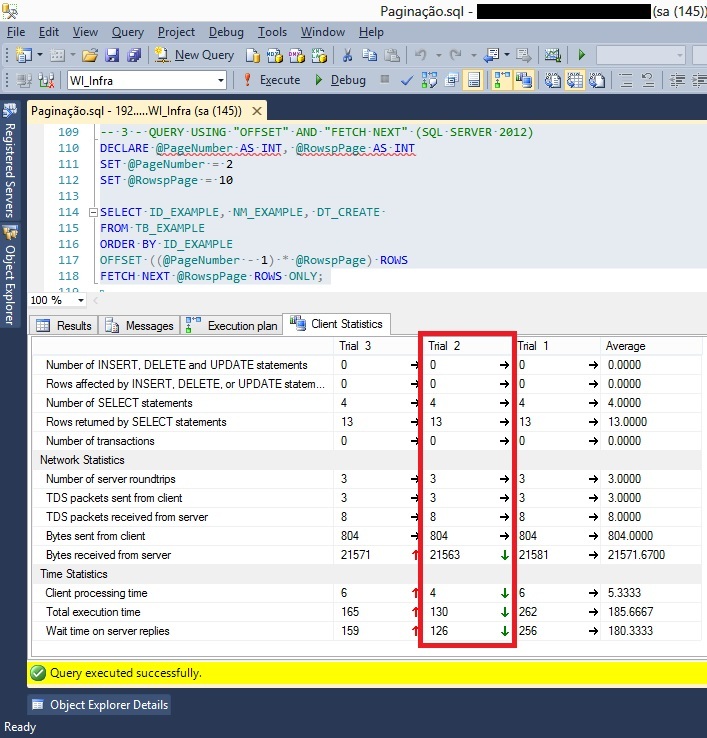 In the data optimization query by T-SQL has a considerable gain both using the ROW_NUMBER as use of OFFSET / FETCH, but taking into account the analysis of these data we can see that the "script 3" query (using OFFSET / FETCH ) may be the best option for large volumes of rows, if you use a SQL server 2012 version.